The San Diego State Men’s Lacrosse team faced off against the 25th ranked Utah Valley on Saturday afternoon, losing 14-10. The Aztecs came into the game with a 3-7 record, hoping to break a tough 6 game losing streak. Conversely, Utah Valley came in 7-1, fresh off a 23-9 loss to Arizona State. Unfortunately for the Aztecs, Utah Valley came out hot, taking a quick 5-1 lead. The Aztecs’ defense was unable to contain Utah’s fast moving offense. Pair that with bad turnovers and mental errors equaled a tough first quarter for the Aztecs. The second quarter was more of the same for the Aztecs, as Utah valley was able to increase their lead to 8-3 going into the half. The Aztecs had a rough first half, recording merely 7 shots on net, and only being able to score 3 goals. Captain Pat Greene noticed the sluggish start for his team. The Aztecs did just that in the third quarter. Greene was able to score 3 times in the third quarter to help cut the deficit. With good offense, the Aztecs also picked it up defensively in the third after a quick goalie switch at half. Goalie Steven O’Sullivan played lights out in the second half for the men’s lacrosse team. He was able to make 8 saves in the second half to keep the game close. Although the Aztecs managed a quick goal at the start of the 4th, cutting the lead to just one for Utah Valley, the Aztecs soon regressed to their position at the start of the match, as Utah Valley scored 4 more goals, bringing the lead to 13-8 late in the fourth. Ultimately the Aztecs were unable to complete the comeback and fell to Utah Valley 14-10 as their losing streak now stands at 7 in a row and are 3-8 overall. Captain Owen Schnur says this will not deter SDSU. The Aztecs will take on the USC Trojans (6-5) on Saturday March 30th in a very crucial conference game. How Will Rashaad Penny Do In His 2nd NFL Season? Speculations on the Seattle Seahawks decision to draft Rashaad Penny as their 27th overall pick, and what’s next for the SDSU alumni. With the 2019 NFL Scouting combine, the top talent from this year’s NCAA class will be showcasing their skills in order to land themselves on a professional football team come time April. A couple of those prospects include junior defensive end Nick Bosa from Ohio State (L.A. Charger Joey Bosa’s brother), Christian Wilkins from the national championship winning Clemson Tigers, and the University of Alabama’s running back Josh Jacobs. However, I was left wondering how some of the prospects that went onto to be drafted from last season were holding up in the National Football League? One person stood out to me right away… Rashaad Penny. Rashaad Penny, a San Diego State University graduate and former Heisman Trophy candidate, weighed 220 pounds and ran a 4.46 second 40 yard dash at the 2018 combine in Indianapolis. Though some scouts believed him to be a slow and heavy running back, I knew from my time watching him at San Diego State that he was going to be a threat at the professional level. The Seattle Seahawks decided to trade one of their draft picks to acquire Rashaad Penny as the 27th overall pick. I guess San Diego State alumni make 1st round picks too! Immediately, there was buzz surrounding the Seahawks’ latest 1st round draft choice. Pete Prisco, a sports writer, did not take too kindly to the choice and gave the Seahawks a D grade. “He’s a nice runner, but they have so many other needs and there are better backs. Weird.” Prisco said. The pick started to make more sense to me as I thought about it. 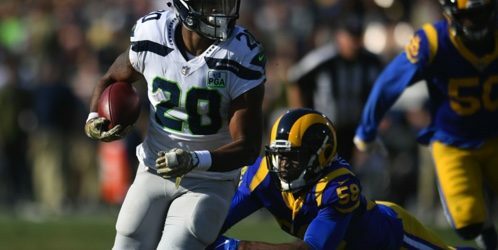 With the loss of Eddie Lacy and Thomas Rawls to free agency because of a plagued offensive line and lack of production in the run game, nobody was there to receive a handoff from Russel Wilson for Pete Carroll’s offense except for Chris Carson & Mike Davis (who combined for a lackluster 448 rushing yards all of 2017). I guess this is where head coach Pete Carroll thought Penny could fill in. Over the course of the first four games, Penny managed to carry the ball 29 times. However, his carries were limited to Carson and Davis for the next 4 weeks and only received 54 rushing yards over that time span. I was afraid that Penny was starting to turn more into his SDSU teammate, Donnel Pumphrey, who got cut by the Philadelphia Eagles after just one season. However, that all changed when Penny went off against the Los Angeles Rams at the L.A. Memorial Coliseum where he ran 108 yards and scored first career rushing touchdown. Penny then went on to score one more touchdown later in the season against the San Francisco 49ers. Let’s get some things straight. The Seahawks like to use the West Coast offense behind offensive coordinator Brian Schottenheimer. They also utilize the run-pass option in which Russel Wilson can hand off in case of a blitz, or tuck and run to pick up a few yards if need be. I believe Rashaad Penny is perfect for this style of play. He can pass block while receivers such as Baldwin and Locket get open in the slot, or he can take the ball up the center of the field pick up some yardage on a draw play. Will Rashaad Penny produce more in his second year? I believe so. He is a big, versatile back that can run the ball and catch passes when he needs to. It appears that he has found a home in Seattle for the time being and I can’t see any reason why Coach Pete Carroll would want to get rid of him anytime soon. Unless the Seahawks trade up again to acquire another back in the draft or they pick up one in free agency this summer, I can’t see him getting less touches than he had the previous year. I predict that Penny will at least match and/or increase his total of touchdowns in the 2019 season. I also believe he will double his all-purpose yards to bring him in somewhere between 800-900 yards. This is all being said if he stays healthy. On March 6th, the San Diego State men’s basketball team faces off against Fresno State University, hoping to gain a bid into March Madness. This is the 30th game of the season for SDSU and will feature a senior night farewell to stars such as Jeremy Hemsley, Devin Watson, and Michael Sohikish. The Aztecs have won 9 out of their last 11 games and will battle Fresno for the 3 seed at the Mountain West Championship hosted in Las Vegas. With a win against Fresno, the Aztecs would go undefeated at home in conference play for the second time in 20 years. Although the Aztecs will receive an automatic bid at the conference tournament, the question remains whether they will make the March Madness bid? SDSU has appeared in 14 NCAA tournaments in school history and they have a chance to make the 68 team bracket in a couple weeks. However, Utah State or the University of Nevada will probably receive the automatic bid to March Madness. Though SDSU is the reigning conference champion, Utah and Nevada have both won at least 6 more games than SDSU in the 2018-19 season. 32 teams receive an automatic bid to March Madness based on their conference championship, 36 receive an at-large bid, and 4 play for the 16th seed in Ohio during the First Four tournament. It is going to be awfully close in terms of whether or not SDSU will make the bracket. I project them to be “on the bubble” and finish the season with a 20-11 record, beating Fresno at home and losing to #17 Nevada on the road. That kind of a record will float them just around a .650% winning percentage for the season, which is NCAA March Madness material. First, they have to beat Fresno at home and give Nevada a run for their money. Look for 2-time MW player of the week Jalen McDaniels to help aid them in that journey as he is averaging 16.4 points per game this season. Strength of schedule will play a factor in the NCAA’s evaluation tool for determining the 38 teams. I believe that beating Nevada in a stunning fashion on February 20th at Viejas Arena, and playing them on the road to end the season will boost SDSU’s chances of making the tournament. Come March 17th, hopefully San Diego State’s name will be called. After a rain-shortened weekend in Fort Collins, the San Diego State Aztecs Baseball team is returning home to take on a couple of tough opponents. Despite losing 9-5 last weekend to the Air Force Falcons on March 1st, San Diego State’s Aztecs Baseball senior shortstop Angelo Armenta went 3-for-4 with two RBIs. On the pitching side, Logan Boyer got the start and had a rough outing. In three innings, he gave up five runs (all earned), two walks and had four strikeouts. As of Tuesday morning, the Aztecs baseball team are at the bottom of the Mountain West Conference with an overall record of 0-1. It’s still early in the season but SDSU will have to fix their rough start. First up this week is the nationally-ranked Texas Tech Red Raiders who played in last year’s College World Series. This 14th ranked team will come to San Diego Tuesday at 6 p.m. and Wednesday at 1 p.m. The Aztecs last beat Texas Tech in 2015, with a 9-0 shutout victory. Besides that, the Aztecs are 1-13. Freshman Aaron Eden will start Tuesday night against Texas Tech’s the Red Raiders. Eden has an 1-0 record. His last start came on Feb. 26 when he went 6.1 innings, only giving up two hits, two walks and 12 groundouts to the cross town rival, the University of San Diego. Wednesday’s game is SDSU faculty and staff appreciation day as well as free SDSU sunglasses to the first 250 fans in attendance. Over the weekend, the Aztecs will face their second Mountain West opponent of the season against the University of Nevada. The games on Friday and Saturday are scheduled to begin at 6 p.m. and 11 p.m. respectively. For Saturday’s game, the first 300 fans in attendance will receive a free SDSU Baseball t-shirt. Nevada is a big opponent for the Aztecs because the Wolfpack won the regular season title last year. The defending Mountain West Tournament Aztecs (0-1 MW) are hoping to get their sixth MW title in seven years led by head coach Mark Martinez.